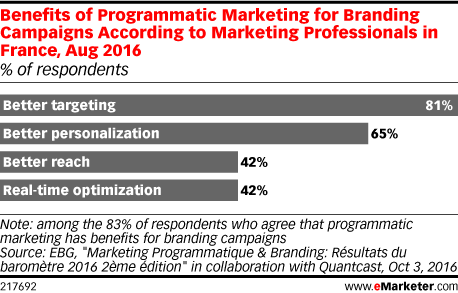 Data is from the October 2016 EBG report titled "Marketing Programmatique & Branding: Résultats du baromètre 2016 2ème édition" in collaboration with Quantcast. 850 marketing professionals were surveyed online during June 22-August 25, 2016. Respondents included advertisers (57%), agencies (14%) and publishers (29%). All of the advertisers and agencies were decision-makers, whether managers (45%) or stakeholders (55%) of digital display media buying. The industries represented include advertising/media, automotive, consumer electronics, consumer products/distribution, financial services/insurance, luxury, telecom/IT, services, textiles/fashion and tourism/hotels/leisure.